Excitement is building throughout the Junior and Training Bands as they prepare for a weekend of music and tutoring which will culminate in a concert featuring the entire Junior and Training Bands along with their tutors. 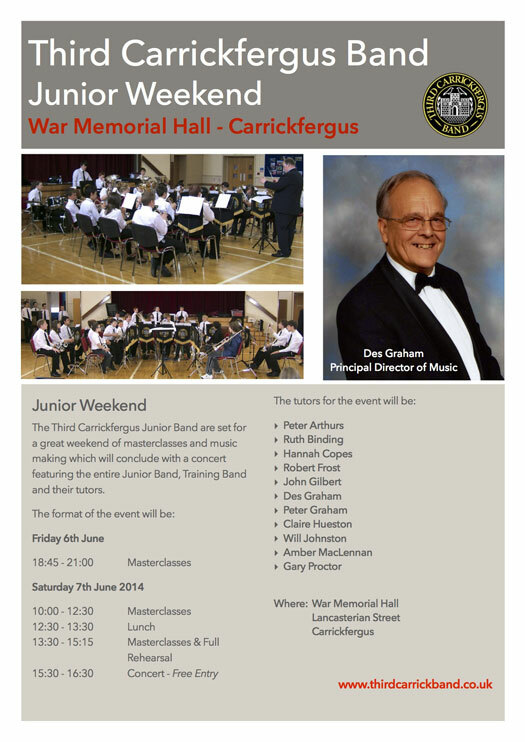 The event will take place in the War Memorial Hall, Lancasterian Street - Carrickfergus on Friday 6th June and Saturday 7th June and will feature Principal players of the senior band giving masterclasses and preparing the young musicians for the concert which will take place at 15:30 on Saturday afternoon. The tutors are looking forward to the opportunity of working with the junior band members where their experience and teaching will hopefully give suitable encouragement to our up and coming musicians.